Barbie Dreamtopia Sparkle Lights Mermaid Doll with Swimming Motion and Underwater Light Shows, approx 12-inch with Pink-Streaked Blonde Hair, Gift for 3 to 7 years old. 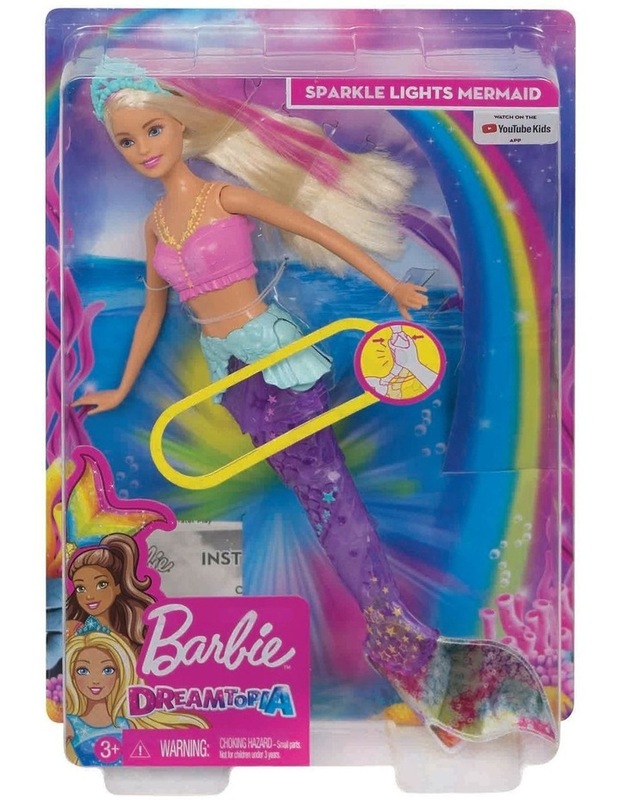 Make a splash with Barbie Sparkle Lights Mermaid doll from Barbie Dreamtopia -- her tail features magical "swimming" motion and light-up action making her a great gift for young kids! Easy activation means kids can repeat the fun over and over again for storytelling surprises and magical effect! Simply dip Barbie mermaid doll into water to activate a rainbow light show within the translucent purple tail -- or push the sides of her peplum for a light show on land; a variety of combinations add to the surprise and delight! While holding her in the water -- or out -- press the sides of her peplum to start a swimming motion in the tail; it's so realistic, imaginations will dive right into storytelling! Barbie doll's outfit adds to the magic with a light-catching shimmery pink bodice and shiny translucent tail; accessorize with the translucent blue tiara for more fairytale fun! Dive into storytelling with Barbie Dreamtopia Sparkle Lights Mermaid doll -- collect all the Barbie Dreamtopia dolls and toys to recreate favorite scenes or tell your own fairytales and sail away with Chelsea and her big sister Barbie (each sold separately, subject to availability).